Kefir grains, a microscopic workforce ready for action. This is a rather common question in my home as I am constantly fermenting food and drink. I have developed a passion for it. I have developed a passion for the flavor and nutritional benefits of fermented foods as well. Fresh milk with kefir grains just added (on the left); mature kefir (on the right). My latest project is kefir. Kefir is a specific type of fermented milk. For those that are turned off by the idea of “fermented milk”, just remember that cheese and yogurts are also cultured (i.e. fermented) milk products. 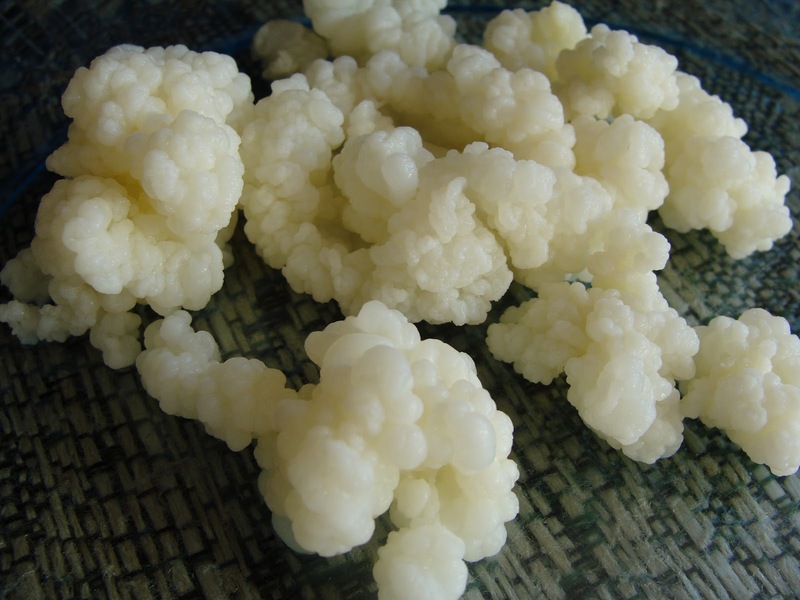 The key to producing kefir is the use of kefir grains. These “grains” are really a complex community of bacteria and yeast that live together in a mutually beneficial, community-built and maintained matrix of proteins, fats, and sugars. The grains resemble small florets of cauliflower. This group of organisms are sometimes called a SCOBY (Symbiotic Community Of Bacteria and Yeast). Kefir grains contain well over a dozen different species in varying proportions depending on the source and circumstances of growth. Making milk kefir is simple. Fresh milk is added to a jar with a small amount of kefir grains. 6-48 hours later, depending on how sour you like it, the grains are strained out to be used for another batch, and the resulting Kefir is used as desired. Kefir reminds me of a thin yogurt. If it is left to sit longer (about 48 hours), it develops a stronger, more sour, flavor that reminds me more of a stronger cheese… a bit like blue cheese or Roquefort. If only fermented for 6-12 hours, it is like a very mild yogurt. Kefir-stuffed tomatoes over mixed salad greens… with a Hofbrauhaus beer on the side! Milk kefir is easy to make. Easy to maintain. Easy to use. Has a great flavor. On top of that, it introduces plenty of beneficial microbes to you gastrointestinal tract. I highly encourage everyone to give it a try.